Tel Aviv is a vibrant modern city that is best known for its sun-drenched beaches, pumping nightclubs, designer shopping, crowded street markets and high culture. What it lacks in antiquities, Tel Aviv makes up for in commerce. One third of Israel's population have made this bustling metropolis home. Over weekends, residents from nearby towns head to Tel Aviv looking for entertainment and relaxation and city-slickers spill out onto the city's beaches to soak up the Mediterranean sun. The diversity of the population is reflected in the architectural variations and influences, such as the Yemenite Quarter and the Vodka cafes of Allenby Street. Tel Aviv also provides an ideal base from which to explore other parts of Israel, including Jaffa, the Galilee area and Caesarea. Visitors can go rock-climbing, browse street markets, dine on seafood in the Old Port, party the night away, sunbathe on the beach or tour a top museum. These are just some of the diversions available on a holiday in Tel Aviv, which, like New York, is a 'city that never sleeps'. 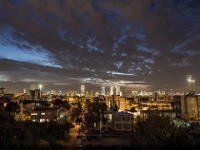 Tel Aviv is the hip and happening commercial centre of Israel. A holiday in Tel Aviv is great for families looking for fun in the sun, shopaholics who lust for its many malls and markets, and young travellers who revel in the nightlife and young vibe of the city.